In November, I shipped off my Schnitzel and Boo Swap package. My partner, Margaret, told me that she likes interesting animals. And she had some Tula Pink in her inspiration mosaic. 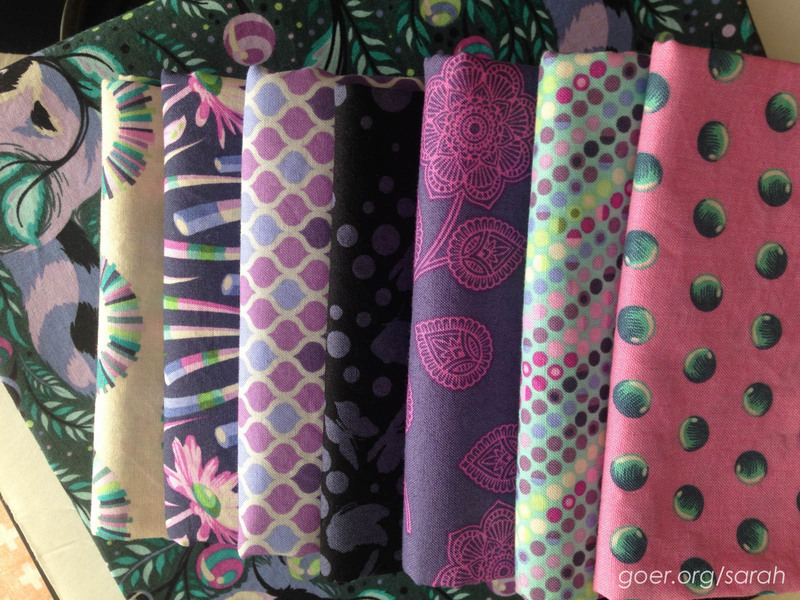 I immediately knew that I had to do something to feature a purple Tula raccoon and had a great time pulling Tula fabric to coordinate. Margaret also had a stripey 8-point star in her mosaic, so I decided to design my own 8-point star with an octagon in the middle. 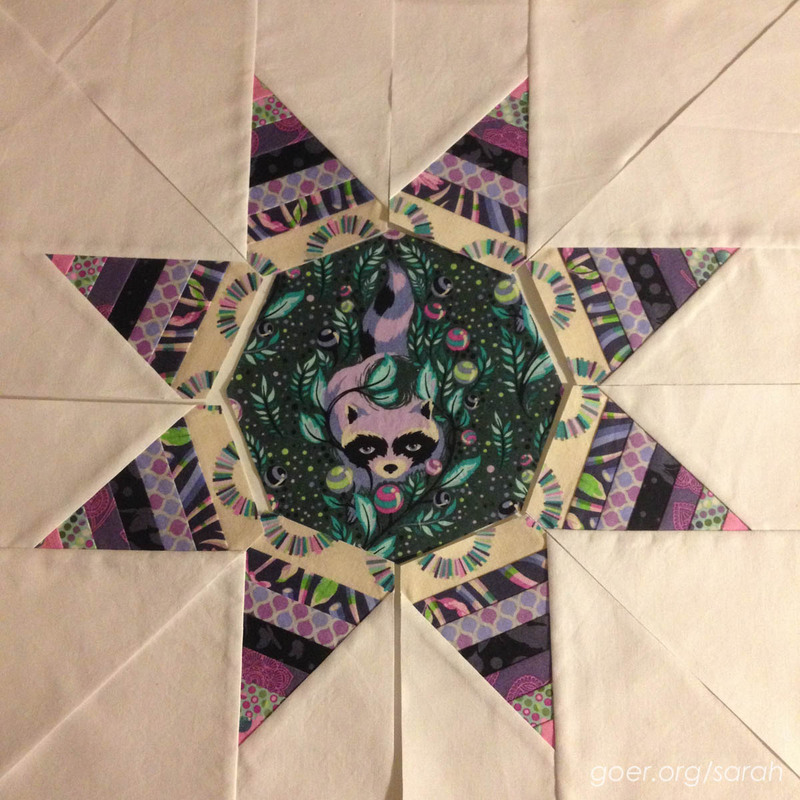 I used EQ7 to create my paper pieced segments to go around my octagon and fussy cut the raccoon to fit in the middle. 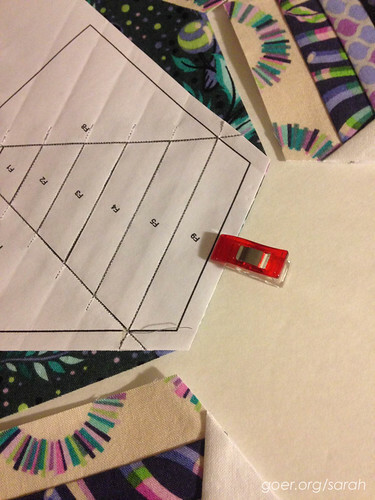 Of course, adding eight segments around an octagon created y-seams. Now, I don't know the "proper" way to go about this, so I'll tell you the "how I just made it up" way. Once I had pieced all 8 outer sections (and leaving the paper on), I attached each of them to the center octagon only. Then I went back and pieced the seams connecting the segments. Two demerits for not changing to white thread for those white to white seams. :-/ Overall, I'm really happy with the process and result. 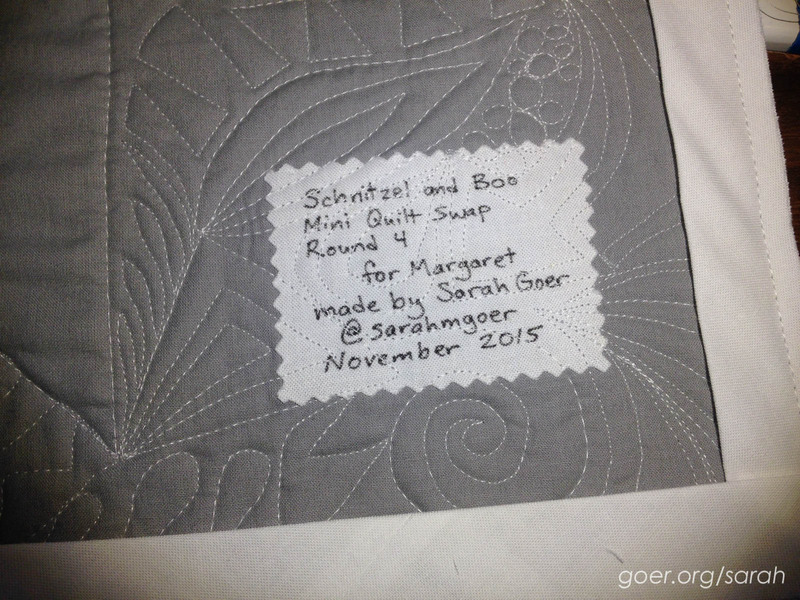 Then came the quilting. Sometimes I have this thing about not wanting to quilt on top of some part of my design to not detract from the pretty, pretty fabric. Yeah, I need to get over that. This time, I decided to just quilt the white background and chose graffiti quilting. I started with an M for Margaret in the lower right. I was a little rusty, but I did a little graffiti doodling to warm up and then jumped it. I'm looking forward to doing some graffiti quilting on a larger quilt, using a larger scale, but I really love the look of the dense quilting on this mini. I attached my lazy mini quilt label to the back with fusible before quilting. I figure a wall hanging won't be washed much, so it works. I was so happy to send it off to Margaret and am so glad she loved it! Here's the awesome mini I received from Melissa for the swap. I like to encourage my swap partners to try something new and to make something they love. I was so excited to receive this beautiful mini! I love that it's not something I would have made myself. Just look at all those awesome curves! And the amazing quilting! I found the perfect place for it next to our colorful wedding ketubah in our dining room. Score! (P.S. I really need to change the quilt on the right to be another colorful 24" mini instead of this smaller one.) All the extras she sent were so thoughtful as well. A lovely zipper pouch, fun office supplies, chocolate, and neat wind up toys for the kids and I to enjoy. Thank you again, Melissa! 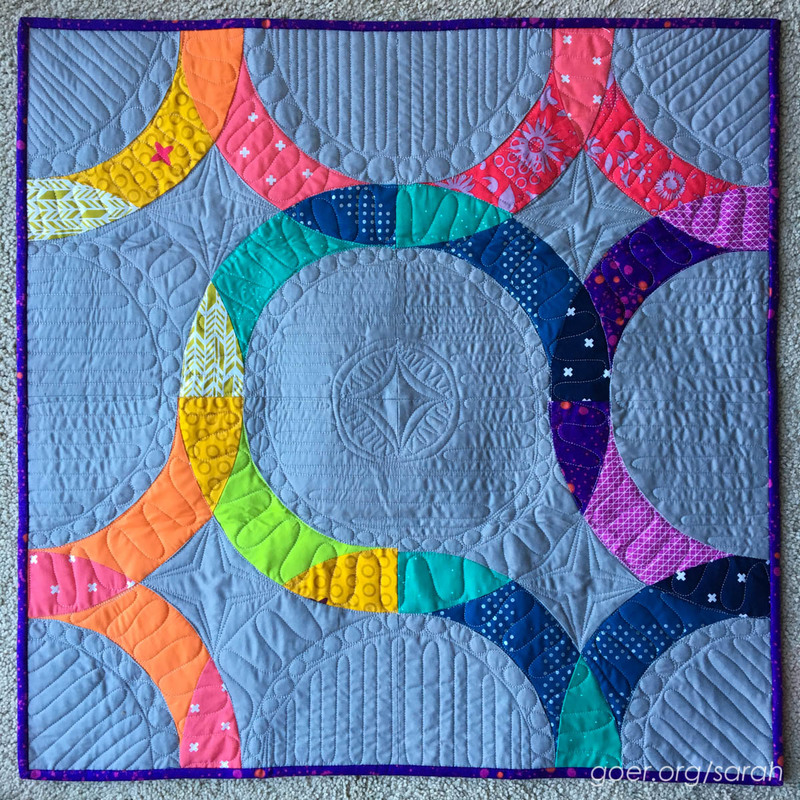 I'm linking up to Finish It Friday, TGIFF at Quokka Quilts, Fabric Frenzy Friday, Link-a-Finish Friday, Needle and Thread Thursday and Adrienne's 2015 Q4 Finish Along post. See all my Q4 goals here. Posted in Quilting. 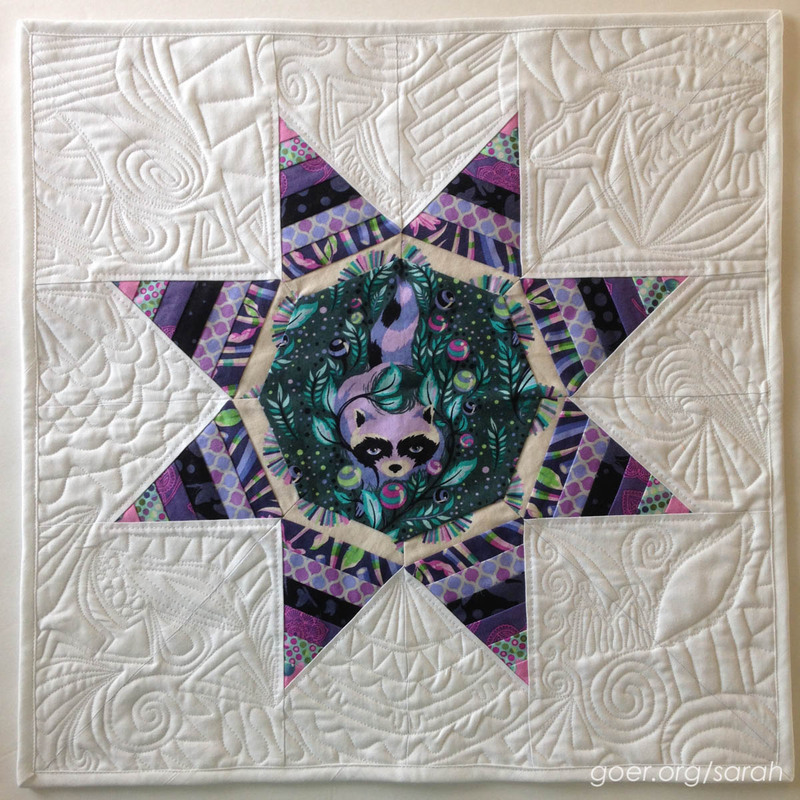 Tags: mini quilt, my own design, schnitzel and boo mini swap, swaps, Tula Pink on December 4, 2015 by sarah. Loved your mini-quilt, the Racoon in the center was adorable. Is graffiti quilting a planned pattern, or free form. You described it well as dense--well done. Graffiti quilting is free-form. I have a number of different types of patterns in my arsenal (arrows, triangles, spirals, etc.) and just start with one and make something different next to it. I think the hardest part of doing this style of quilting was learning how to travel between designs when I needed to get to another area. Thanks for visiting, Sherry. 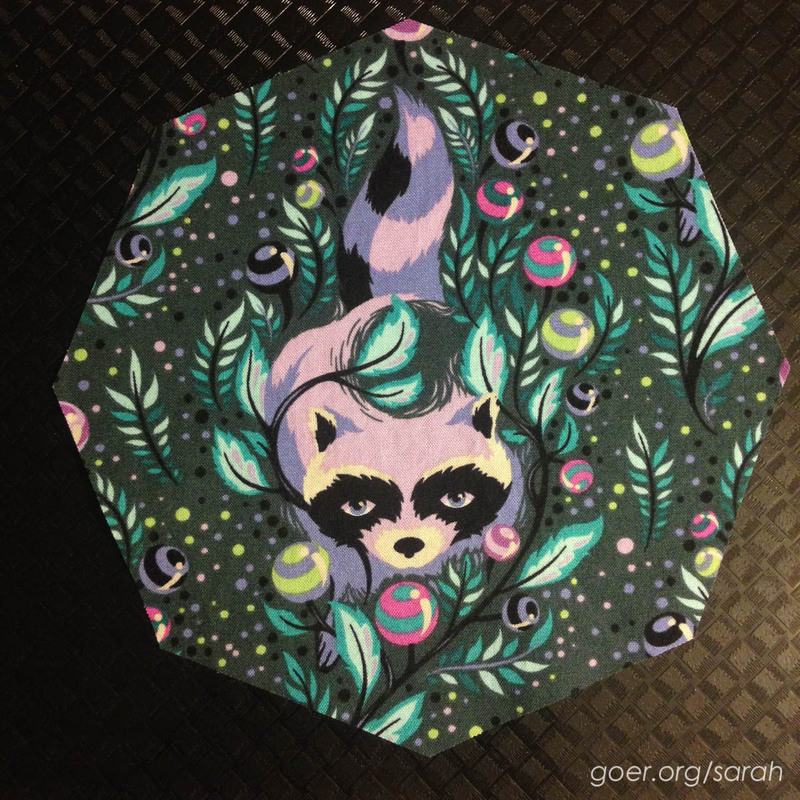 The octagon shows off the raccoon so perfectly! I have not played around with graffiti quilting, and I keep loving when I see others do it. I tried to do daily practice a while back (first on paper, then by machine) and that really helped me initial get it, though I didn't keep it up with the daily practice as long as intended. Now I've used it on a couple small projects. When I practiced I worked on a solid fabric on fusible fleece with contrasting thread so I'll be able to cut up that panel to make zipper bags. I love the raccoon octagon star....so cool!! Thanks, Bo. It was really fun to create. That raccoon is so darn cute! You did an amazing job. And the one you got in return is also amazing. Both quilts are really beautiful! I admire grafitti quilting, and I'd like to try it someday, but I haven't quite worked up the nerve yet. Yours looks great! Thanks, Leanne. You should go for it! I recommend drawing shapes on paper to learn the muscle memory. There are tons of great examples on #graffitiquilting on Instagram. That is a gorgeous mini you made for your partner. I love the graffiti quilting - haven't had a go at that yet ...... it looks great on a mini. And what a lovely package you received! Thanks, Abigail. Graffiti quilting is a lot of fun, and not too hard to get the hang of. You should definitely try it! 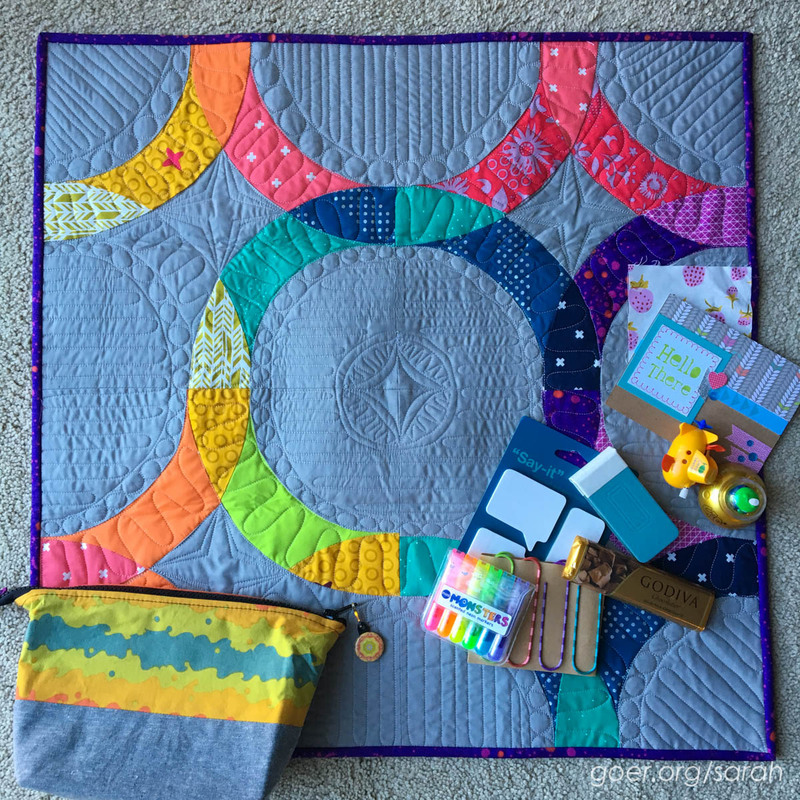 I love the quilting on your mini, it looks great! Both minis are wonderful! So cute. Both of them. I love your background quilting. Your graffiti quilting looks spectacular!! Absolutely stunning!! It's a beautiful quilt you made, and I love the quilting! I'm visiting as part of the 2015 FAL cheerleading team.